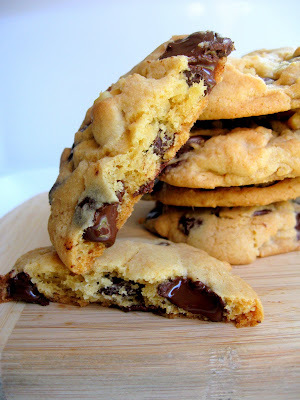 This is my most favorite chocolate chip cookie recipe. It's in Sherry Yard's cookbook called Dessert by the Yard. 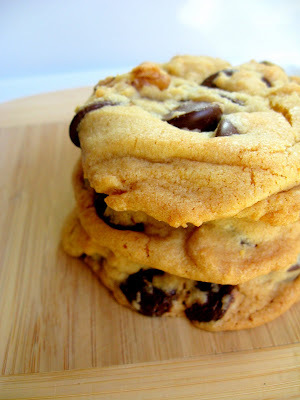 I've made many a chocolate chip cookies in the past years but this is by far the best recipe I've come across. Maybe it's the amount of sugar... or the delicious bittersweet chocolate.. I don't know exactly what but it's delicious. 4 ounces (1 stick) Unsalted Butter, Room Temp. Preheat oven to 350 degrees. Prepare 2 sheet pans with parchment paper or silpat. Sift flour and baking soda together and set aside. In a bowl of a standing mixer with a paddle attachment cream the butter until lemony yellow, about 2 minutes. Add both sugars and salt and cream for about 1 minute. Make sure to scrape down the sides. Add the egg and vanilla and beat on low for about 15 seconds or until egg is fully incorporated. On low, add flour mixture. Beat slowly until all of the flour is incorporated. Add chocolate and fold in. Scoop spoonfuls onto the sheet pan with about 2 inches of space between. Bake for about 12-15 minutes rotating half way until light brown. Warm chocolate chip cookies fresh out of the oven reminds me of one of my favorite movies. There's a scene in Stranger Than Fiction where Harold Crick, the IRS agent, is forced to eat a freshly made chocolate chip cookie by a baker that he's auditing. I would do it with cookies."